A stand of “KU-2” quinoa maturing; August 2014. 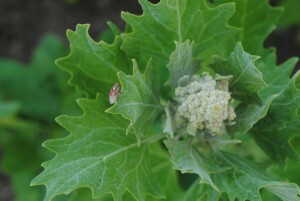 Lygus bugs are one of the insect pests of focus for this project; Lygus bug on quinoa June 2014. The long-term goal of this study is to improve the sustainability of agriculture in the dryland cropping areas of the Pacific Northwest by using key principles that researchers and growers have learned in this area while addressing key unknowns. 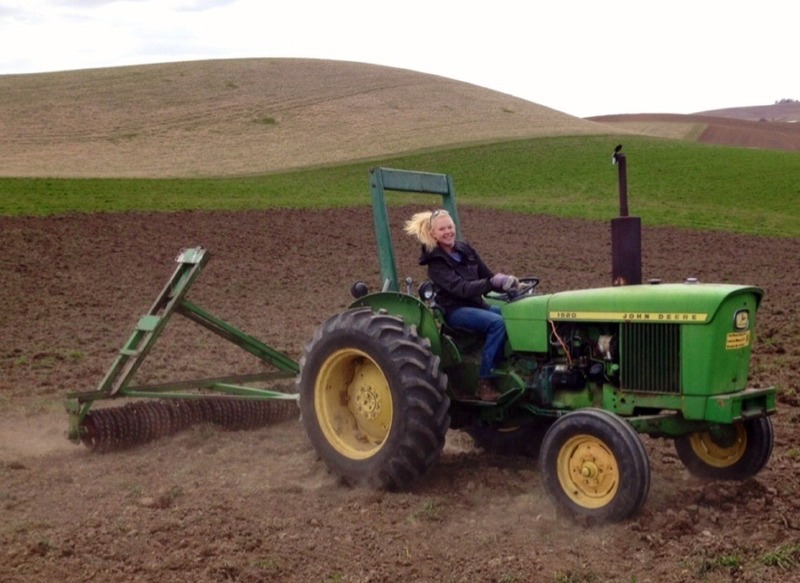 We know that soil erosion must be minimized on the hills of the Palouse region, that change in the status quo must be economical, and that organic crops can have large price premiums. We know that organic crop production must incorporate significant legume phases to provide affordable nitrogen. 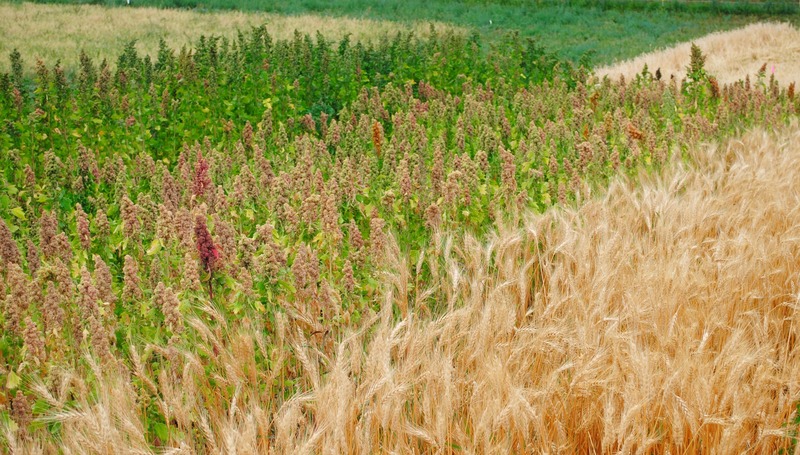 We think incorporating quinoa can help address many issues; however, we do not know how well quinoa can yield in our region as part of larger appropriate dryland crop rotations, nor how the pests and nutrient demands of this crop will interact with those of other locally adapted crops. 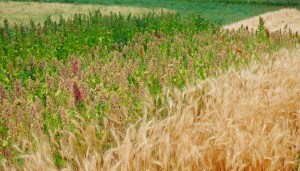 From R-L: Spring wheat, “KU-2” quinoa, and “Cherry Vanilla” quinoa; August 2014. This study takes a systems perspective to evaluate the effects of diversifying organic crop rotations with quinoa. Agroecological parameters that directly and indirectly affect the sustainability of organic cropping systems are being measured, such as: crop yield and quality, insect pests, weed populations, soil properties, nitrogen use, interaction with a key soil microbial symbiont (arbuscular mycorrhizal fungi), and economic performance. By conducting integrated on-farm research and educational outreach, this project will fill critical knowledge gaps regarding dryland organic crop rotations, including the introduction of quinoa. 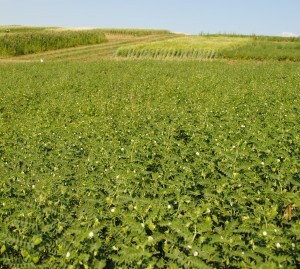 A view of experimental plots in July 2015. The Zakarison Partnership is located in the heart of Palouse country, near Pullman, WA in Whitman County. Owned and operated by Eric Zakarison and Sheryl Hagen-Zakarison, the farm has been in the family since 1935. Eric and Sheryl farm 600 acres of their own and 700 acres of the Walt Zakarison Inc. estate. Both have agronomy degrees from Washington State University, and Sheryl has an additional degree in accounting and a Master’s in Public Administration. Besides farming, Eric has worked for the USA Dry Pea & Lentil Council, the WSU College of Agriculture, the Washington Wheat Commission, and the USDA. Sheryl also worked for WSU International Programs. With all of this education and experience, Eric and Sheryl have developed specific goals for their farming operation. The primary goals of the Zakarison Partnership are to help protect the productive yet fragile soils of the Palouse and to lessen the farm’s dependence on fossil fuels and oilderived inputs. Around 80% of their inputs are either raised on the farm or purchased locally. They work to develop systems for producing food that are both viable in the present and sustainable for the future. Zakarison Partnership grows a wide variety of crops, many common to the Palouse region. These include soft white wheat (spring and winter), spring barley, spring dry peas, oats, camelina, hay (a mix of alfalfa and brome), and Austrian winter peas. They have developed rotational systems with hay and grazing Dorper sheep that support healthy soils and sustainable transition to organic management. The diversification of crops along with the integration of livestock provides for a stable farm enterprise that will remain economically viable over the long term. Zakarison Partnership has a great interest in educating the next generation of farmers and are often involved with research at WSU to further promote innovation in the growth of sustainable and organic agriculture. A nice stand of organic chickpeas flowering, July 2014. Policy training helps students tackle global challenges – WSU CAHNRS news release featuring R. Wieme and her role in the project. Tilth Producers of Washington Farm Walk: June 8, 2015 – our project was the site of a 2015 farm walk tour. Wheat and Small Grains – Organic Production – CAHNRS and WSU Extension page on organic wheat & other small grains. 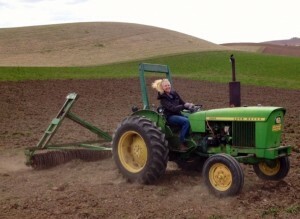 PhD student Rachel Wieme preparing the field for the establishment of Entry #2; April 2014. Photo: S. Higgins. All photos by Rachel Wieme unless otherwise noted.